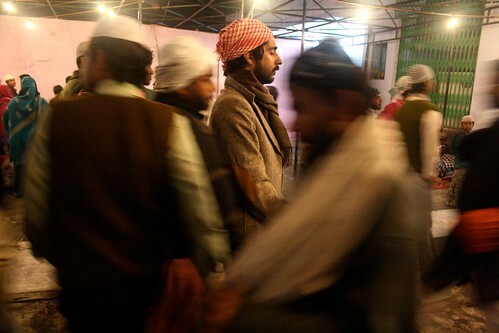 Reached via the congested bylanes of Meharuli, south Delhi, the shrine is entered through a broad uncovered pathway. 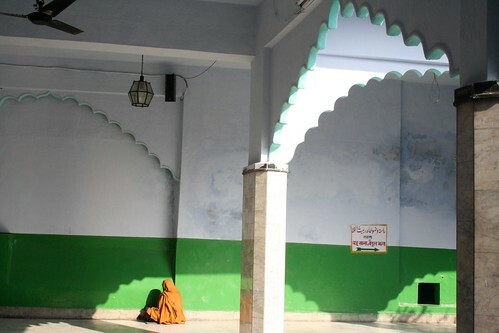 Outside an old red mosque, sit the dargah qawwals. It’s a getaway from the city chaos. 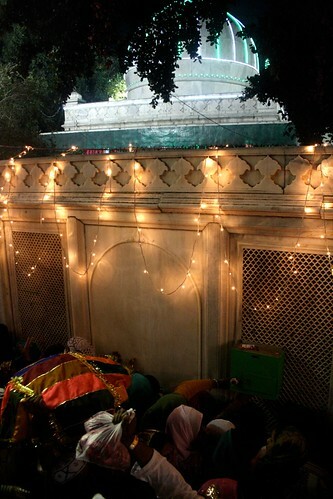 The tomb of Khawaja Syed Muhammad Qutbuddin Bakhtiar Kaki, a 13th century mystic, whose Urs – or the death anniversary – was celebrated on the night of February 17, 2011, is Delhi’s oldest and quietest sufi shrine. The Delhi Walla attended the evening. I went there a few days ago too and had talked to people there. Presenting his visiting card, Haji Idris continued with the story. “A few days after Khawaja’s burial, the qawwals were reciting the same verses next to Huzoor’s grave when his arm came out of the tomb. Huzoor asked the recitation to be stopped or else he would be again seized by ecstasy and his whole body would come out of the tomb, in violation of Islamic laws.” Since then qawwalis are performed outside the walls the tomb. 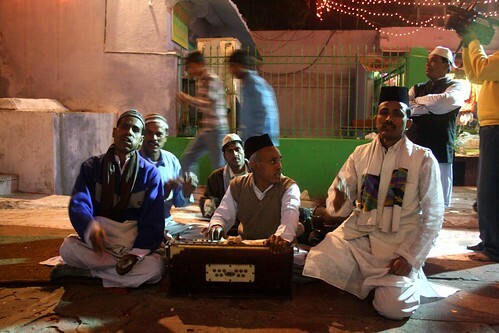 “Delhi will live on as long as this dargah stands,” said Haji Idris, as his fellow qawwals nod. Almost all rulers of Delhi sought the blessings of Khawaja Qutub. Qutubuddin Aibak named the Qutub Minar after him. Iltutmish built the Gandhak ki Baoli step well for Khawaja and his followers. 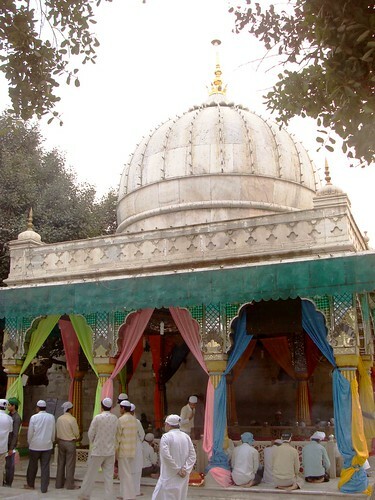 Alauddin Khilji, Mohammad Bin Tughlaq and Feroze Shah Tughlaq were regulars at his dargah. 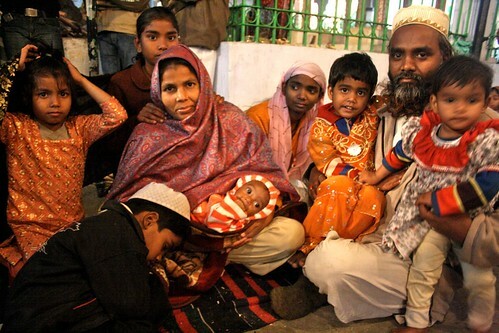 Timur, the invader who massacred thousands in Delhi, is said to have lowered his head at the shrine. Bahadur Shah Zafar, the last Mughal emperor, wished to be buried close to Khawaja Qutub and marked a tomb for himself nearby. He was exiled by the British to die a lonely death in the remote Rangoon. 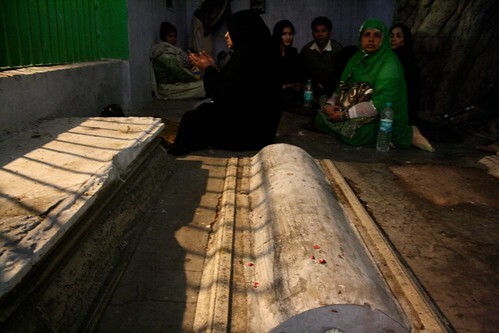 If Zafar had been buried here, he would have still been lonely. 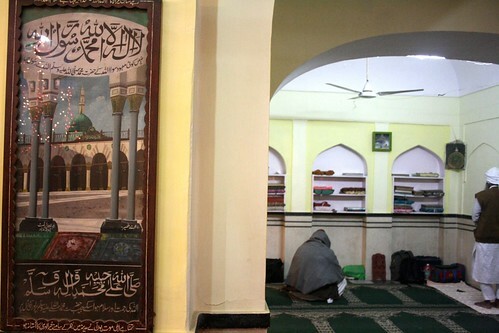 Khawaja Qutub’s shrine is not as popular as, say, Nizamuddin’s dargah, although he is known as the dada-pir, or grandfatherly spiritual master, of Hazrat Nizamuddin. 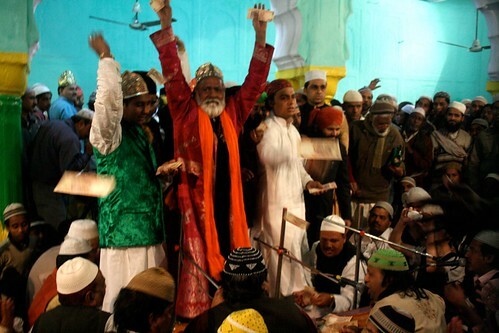 (The baton of Chishti spirituality passed from Khawaja Qutub to his disciple Baba Farid who passed it to Hazrat Nizamuddin.) 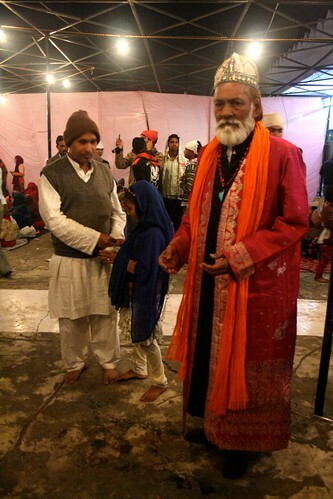 Not many beggars, pilgrims, tourists and intermediaries are seen in the shrine. 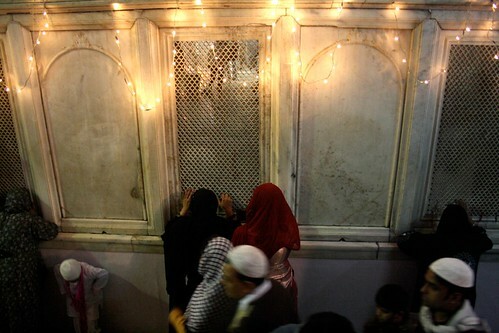 The inner compound of the dargah is barred to women, who pray through the marble trellis built by Emperor Farukhsiyar. 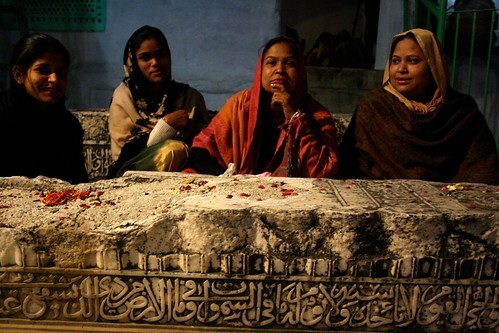 Close to Khawaja Qutub’s grave lies about 50 marble tombstones, arranged in rows. 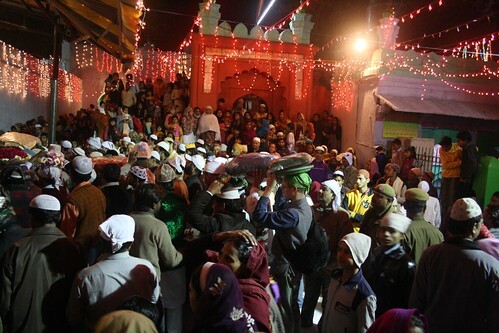 A khirni tree provides shade to devotees. 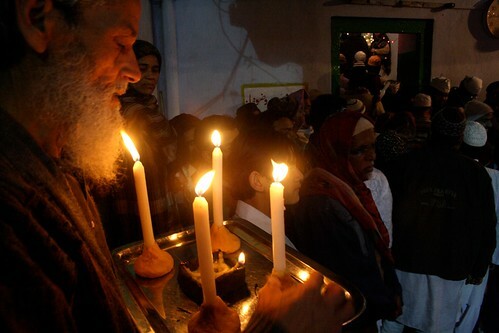 In evening, the khadims light candles under it. 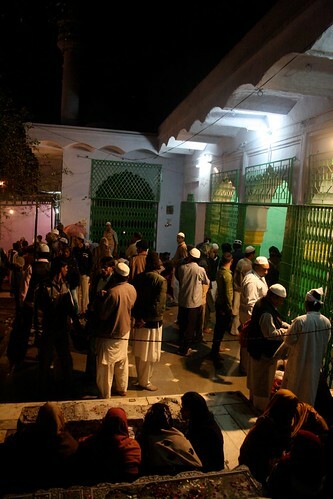 The tomb’s door closes after the maghrib prayers at about 7 pm. 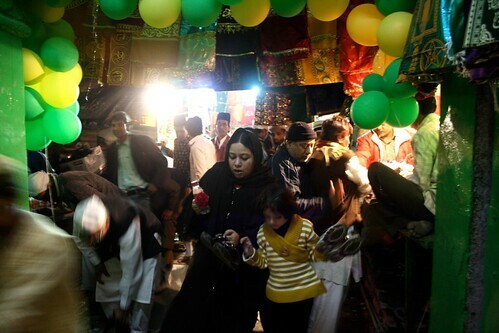 Is Nizamuddin dargah so wildly popular because of its easier accessibility? Around it has sprung up a civilisation of residential colonies, neighbourhood markets and bus stops. The railway terminus is across the highway. In Mehrauli, which is at one end of south Delhi, Khawaja Qutub’s tomb lies forlorn. The silence is absolute, save the drone of planes preparing to land at the airport. The ascetic died in 1235. 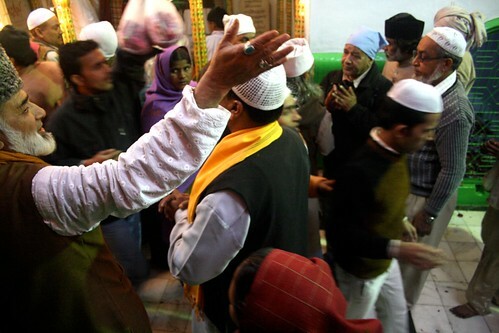 A sufi’s death is a cause for celebration as he is finally united with God – the ultimate beloved. 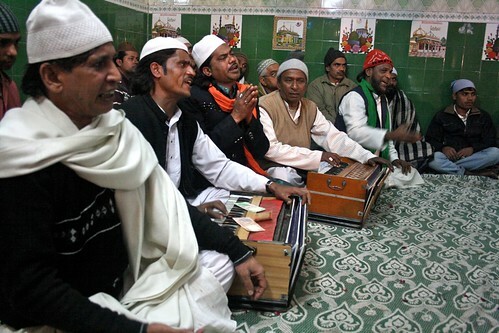 Khawaja Qutub’s Urs is celebrated over three days. 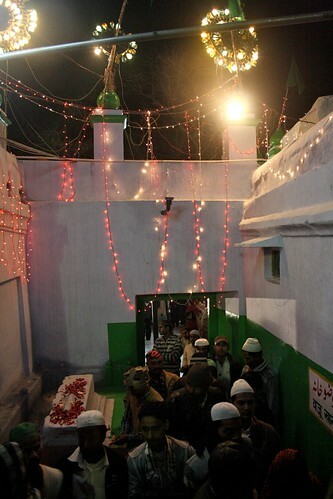 On the evening of 17 February, 2011, the tomb was washed with rose water and brightened with sandalwood paste. The shrine was decorated with marigold flowers and Chinese lamps. The following evening, it got very crowded, which is very unusual for this place. 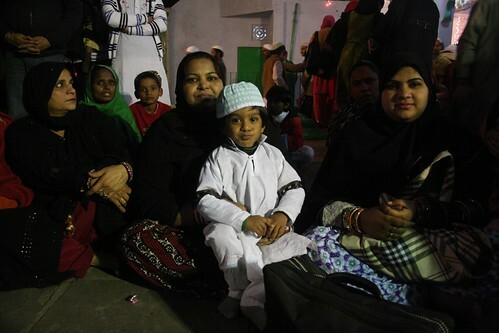 A chaadar from the dargah of Gharib Nawaz in Ajmer was presented at Khawaja Qutub’s tomb. 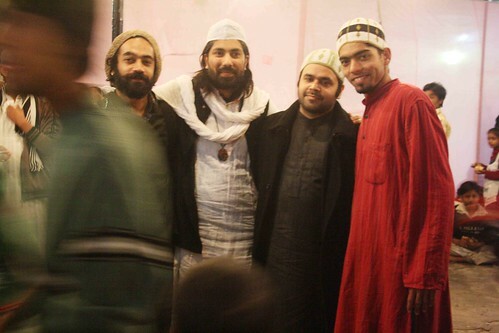 Immediately afterwards, the outer compound, the mehman khana, came alive with qawwalis, which continued throughout the night. Free biryani was distributed. 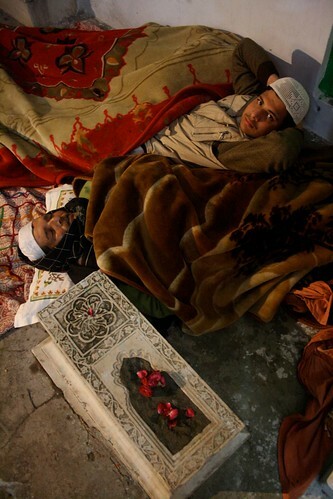 Pilgrims laid out mattresses beside unknown graves, which are plenty in the dargah complex. The other smaller shrines in the vicinity too held qawwalis. 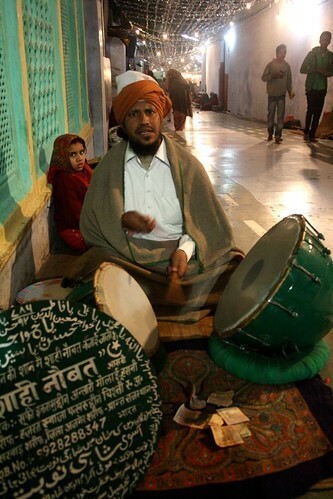 In some, I saw sufis smoking hashish. The Urs celebrations ended the next morning with a special prayer. 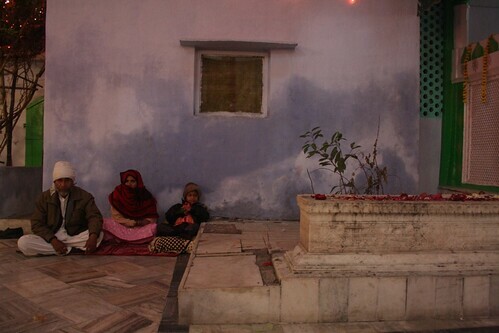 By evening, the dargah returned to its usual quietness.